Spearmint is native to much of Europe and Asia and is naturalized in parts of northern and western Africa, North and South America, as well as various oceanic islands. Spearmint is a word that most people recognize, but often as the flavor of their favorite chewing gum. However, there is far more to this species of mint, which is why it has received so much attention in recent years. Spearmint and curly mint are more versatile than other mints for culinary uses. 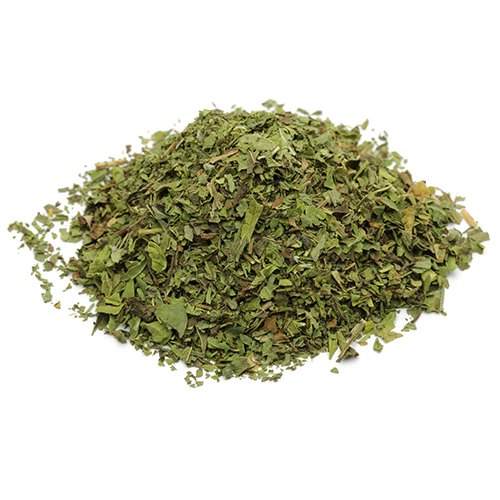 Milder than peppermint, they enhance all sorts of meat, fish, or vegetable dishes. Spearmint has a wide range of applications, including its culinary uses to flavor cocktails, sauces, dips, entire dishes, or used as a garnish. One whiff of a crushed mint leaf and menthol fills your nose with a coolness that invigorates anyone, opening and awakening the sinuses and clearing out the cobwebs in the mind. Mint is exotic and yet a part of our everyday lives. Mint brightens just about any dish, from a couscous salad to potatoes tossed with mint and shallots, from lamb with a mint jelly glaze to homemade peppermint ice cream. For a refreshing touch, rub the leaves around the rim of an iced tea or lemonade glass before serving. Spearmint leaves are often used in different culinary dishes and drinks as a garnish. Spearmint is milder and sweeter than peppermint and makes wonderful mint tea, sauces, and jellies. It is the mint to choose for fresh pea soup and roasted summer tomatoes. Create new flavors in some of your old standby recipes by adding mint. Spearmint requires soils that are well drained and not too dry. Spearmint should be grown in full sunlight in order to produce more essential oils, but can also be grown in partial shade. Cut the stems as you need them during the growing season, though when the plants begin to flower, harvest the whole plant to use fresh or dry.